Stanley Thompson was born in 1893 in the eastern part of Toronto's suburbs and attended Malvern High School in Toronto between 1908-1911. In his youth, he and his four brothers--Nicol, Frank, Matt, and Bill--frequently played golf and were drawn to the game's rising stature on the Canadian sports scene. After high school, Stanley continued his education by taking courses at the Ontario Agricultural College (OAC). During the First World War he enlisted in the army and reached the rank of lieutenant in the Canadian field artillery. After demobilization, he embarked upon the business side of golf in a partnership that offered landscaping of courses and contracting services. By 1921, Stanley had set his course: he formed his own company with brother Frank and another OAC graduate, Ken Welton, and prepared to enter a career as a landscape golf architect. The interwar years were busy. Stanley Thompson worked on more than 140 golf courses that he designed, remodelled, or constructed in Canada, the United States, the Caribbean, and South America. Of course, the vast majority were in Canada. As well, he entered into partnerships that changed over the years. It is not possible to list all the courses that he helped design, but some of his most remarkable contributions include the following notable courses: Capilano in Vancouver; Jasper and Banff in Alberta; Green Gables at Cavendish PEI; Highlands in Cape Breton, Nova Scotia; Seigniory and Lachute in Quebec; and St. George's in Toronto. Thompson's contributions to landscaping in the golf world were lasting. He published the booklet About Golf Courses: Their Construction and Up-Keep in the 1930s that offered some of his more important philosophies on layout and design. 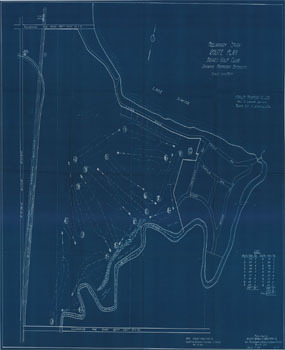 His hazards and bunkers were strategically located to allow golfers different options to approach greens. As well, the sequence of holes was considered important--short and long holes were effectively distributed. But perhaps Thompson's most important legacy was his ability to use natural features--streams, ravines, trees, ridges, lakes, craters and rocks, and various elevations--in both the fairways and around greens. Thompson, along with Donald Ross and Robert Trent Jones (who partnered with Thompson), founded the prestigious American Society of Golf Course Architects that held its first meeting at Pinehurst, North Carolina, in 1947. Thompson served as Vice-President during the ASGCA's inaugural year. Thompson died shortly afterwards in 1953. Thirty years later, in 1980, he was elected to the Canadian Golf Hall of Fame. There is no doubt that Thompson was one of the world's leading golf course architects whose main work spanned the 1920s to the early 1950s. His associates have continued to employ many of the concepts he used in course design. Stanley Thompson has a lasting connection with Guelph. Although he only had a small hand in the layout of the course at the Cutten Fields Golf Club (Cutten Club) in Guelph, after 1940 he and his family had strong ties with the club which they owned and managed. Stanley also had a home and office there named Dormie House which was serviced by Vardon Drive. Stanley Thompson's remarkable career is the focus of the Stanley Thompson Society, founded in 1998 to research, record, and publicize his life and works. The Stanley Thompson Society Collection was established at the Library in 2005. It consists of working drawings, papers, photographs, articles, correspondence, nursery orders, contracts and agreements, reports, handwritten notes, and a few oversize blueprints and drawings collected by the Society, which actively seeks outs information and materials related to his career. The Society's web site includes membership information and links to the history of golf in Canada. Included in the collection are recollections of Stanley Thompson by various people, and feature articles about him in Liberty, Ontario Golf Magazine, Maclean's, Saturday Evening Post, and Toronto Star Weekly. Original photographs, copied materials, pamphlets, and research notes used in the creation of the book The Toronto Terror by James Barclay (published in 2002) are also available for consultation in the Society's collection. The entire Stanley Thompson Society Collection has been catalogued in the University of Guelph Library's electronic catalogue, PRIMO. The holdings can be viewed at the following catalogue link. Online records appear in brief and full descriptions. Full records include project names and dates, format and quantity of materials, clients and related persons, and a brief description of the contents of files along with the library's call number indicating the location of the records. Information about current activities of the Stanley Thompson Society can be found on its website. The Stanley Thompson fonds is a separate series of textual records and drawings that provides valuable original documentation related to his career in course design and personal life. A finding aid is currently under development but the materials are available for viewing on-site.